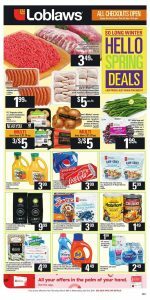 Loblaws Flyer Special Sale 1 Apr 2019 available to check here online. Make your life easier and better with Loblaws store. All your needs available in this flyer. Pick your favorite food today for a better dinner. Love your kitchen with Loblaws ingredients. Also, you can find special recipes of Loblaws in this flyer. After a so long winter hello spring deals available here. Low prices just when you need it! I love the spring deals. Fresh market opportunities are always good. Make delicious selections between over a hundred products. Loblaws Flyer Special Sale 1 Apr 2019 is the best choice if you are looking for cheap foods. Let’s compare Walmart flyer, food basics flyer, no frills flyer, and metro flyer with Loblaws flyer. You will see the most cheaper one is Loblaws. Say hello to spring with special deals. Celebrate sunny days in the backyard! BBQ season is starting. Prepare yourself for the best deals!